This is our current count of lights used in the Model S, and is close to those used on the Model X. All are LED (Light Emitting Diodes), except for the side parking lights. 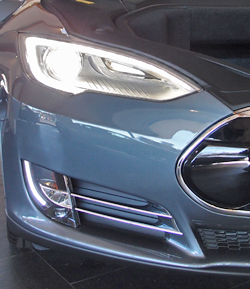 Prior to the 2016 Model S refresh the headlights were HID Xenon and the rear license plate lights were incandescent. Back in 2012 and early 2013 HID headlights were part of a tech package, and the basic headlights were Halogen. Halogens were discontinued later in 2013. The count of LEDS used in the two displays are a total wag, based roughly on one LED per linear inch of display edge. We believe the North America charging port uses RGB (Red-Green-Blue) combination LEDs. While we count each color triad as a single LED, you could argue that rather than 12 LEDs, the charging port has 36 LEDs. European cars use 3 RGB LEDs behind the charging port instead of the ring. We did not include LEDs on the charging cable itself. Yes, the 2 Rear License Plate lights are incandescent. They are 36mm Festoon bulbs – easily replaced with LEDs.